Here Are the Most (and Least) Stressed Cities in the U.S. The world is only getting more stressful -- just looking at the recent examples, Toy "R" Us has closed, and Zsa Zsa, the world's ugliest dog, has gone to doggie heaven. But the city you live in might not be doing you any favors, and maybe getting out of that stress factory you call a major metropolitan area will do you and your blood pressure a world of good. So whether you're trying to figure out why your hair keeps falling out, or you're looking for a place to live a chiller life, check out this study from WalletHub that shows the top 10 most stressed cities and the 10 least stressed cities in the US. First, it comes in handy map form, which is definitely less stressful than a list. To put this together, WalletHub compared over 180 cities (starting with the 150 most populated and excluding surrounding metro areas) in four major categories -- work stress, financial stress, family stress, and health & safety stress -- which were broken down into the 37 smaller metrics like average weekly work hours, debt load, and divorce rates. Each city was graded on a 100-point scale, turned into an overall 100-point score, and ranked against the other cities. It may surprise you to learn that No. 1 here is Detroit (and that New York City, noted super-stressed place, is nowhere in the top 10). 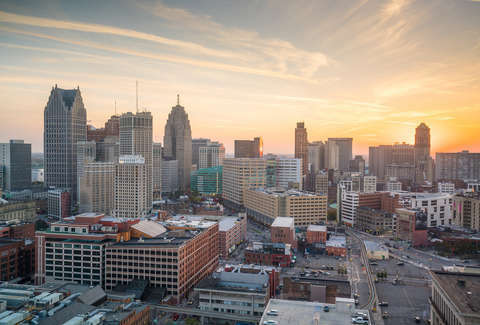 But Detroit had the lowest median credit score, the highest poverty rate, the lowest average hours of sleep per night, and the second highest divorce rate. All of that means you're probably not having a great time. On the other end is Fremont, California, which had the highest median credit score and lowest divorce rate, plus you get to live in sunny California. The big take away here though is that next time your New York friends start complaining, tell them to shut up and send them this.